I don’t know about you but for me, signing a petition isn’t a fun thing. I don’t wake up in the morning and say to myself, “It would be fun to sign a petition today!” To me, the guy asking for my signature had instantly put himself in a category of people who wanted something from me and I wanted to avoid him. He’d become a pesky salesperson. We brushed him off and headed into the store. 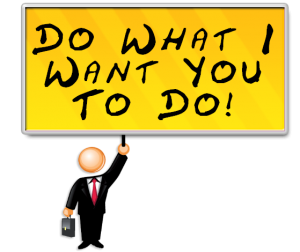 “Here’s what I want you to do.” That’s how many salespeople and persuaders start going about influencing others. They think about it from their own perspective. If you want to influence someone more easily and gracefully, you have to come at it from their perspective. For a moment, let’s explore what gets people to do extreme things. That will give us insight into the most powerful motivations folks have. And that’s going to be pretty useful if we want to persuade them, right? Why, is the reason behind someone taking any action. Let’s face it, people can be motivated to do some powerful things if you have the right ‘why’. How can people be convinced to go to war? Why do some people sacrifice their lives in order to save their children or devote themselves to a religion? Because right or wrong, they have a powerful ‘why’. In NLP, we call the ‘why’ their criterion and it’s always attached to an emotional response. People fight and die for freedom. For love. To do what’s right. There are powerful emotions attached to freedom, love and doing what’s right. If we want to persuade people powerfully, we’ve got to attach what we want them to do to their criteria. The best persuasion scenarios involve finding out what a particular person’s criteria are. Second to that is finding out what most people’s criteria are related to taking an action. Keep in mind, this process will also identify if what you want to persuade someone to do is not a good match for them. If you’re looking to make someone do something that isn’t a good fit for them, this isn’t the way. What If You Don’t Know What A Specific Person’s Criteria Are? Obviously, if you’re creating an advertisement, it’s not interactive. So, you may have to guess at criteria. And you may not always have time to ask someone a slew of questions. If you’re persuading a market you’re familiar with, you should have a good idea about their criteria already. That’s what car companies do in advertising. Sometimes they’re subtle and sometimes not. Do the people they show driving their cars look like they’re successful or do they look like they’re having fun? It depends on whether the advertiser felt success or fun was a more important criterion for their customers. In the case of the guy trying to get people to sign petition, he might find out what’s important to people about signing his petition. More about that in a bit. Let’s cover the 3rd category, just pitching. You know what? Let’s skip talking about the cold pitch. It’s boring and not very useful for persuasion. He may not have the time to ask each person what would be important to them about signing his petition. But if he know his audience, he can probably guess. Let’s suppose his petition was to get the state song of Washington changed to Louie Louie. Believe it or not, a few years ago there was a movement here to do exactly that. Let’s say that people that are open to signing that petition are a fun-loving bunch and it would be fun to them to have Louie Louie as the state song. Let’s add another persuasion principle to that and use the criteria. My guess is they’d be more likely to sign once they declared they like rock and roll. And if fun is a criterion, we might have a winner. PS: Some time I’ll have to tell you about meeting the Kingsmen (some of them, anyway) and the guy that recorded Louie Louie (two separate stories from my music scene days).